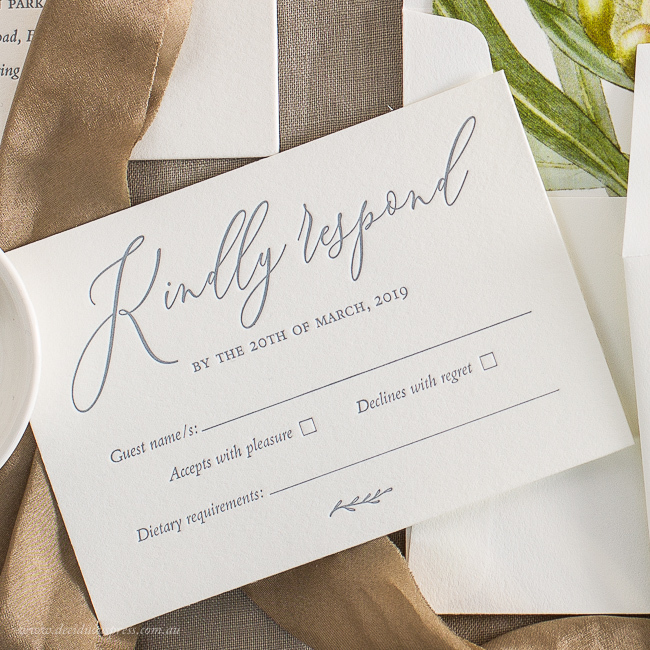 A letterpress response card is the beautiful way of helping your guests to respond to your wedding invitation. For catering purposes you’ll need to know how many guests will be attending your ceremony and reception. 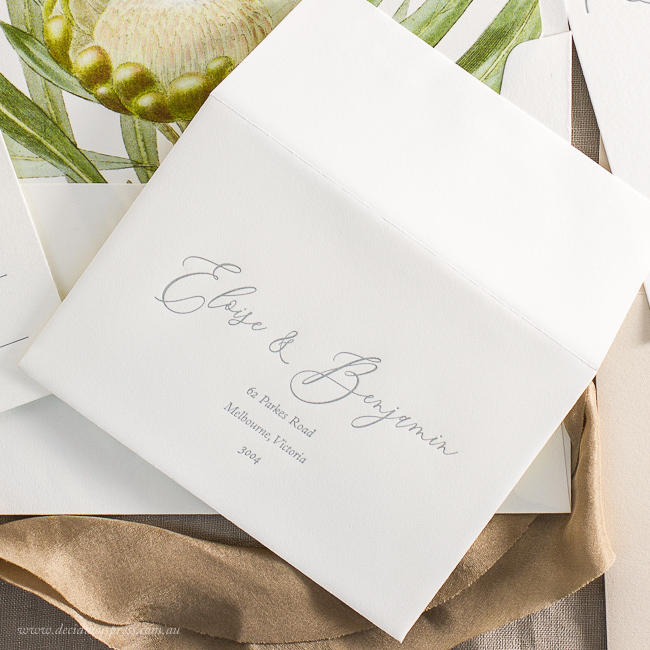 Matching your Invitation design, a response cards can be as complex or as simple as your wedding requires. They are an easy way for your guests to let you know if they will be able to attend your wedding day. At Deciduous press we offer 2 different types of response card to match our wedding invitations. Your choice will depend on your wedding style, your budget and of course personal preference. The first option is a traditional response card with matching envelope and optional return address printing on the envelope front. The small response card allows plenty of space for including details such as an RSVP date, plus space for guests to include their names and other information like dietary requirements or transport requirements. The matching envelope looks gorgeous with the letterpress printed return address. This also makes it simple for your guests to pop the response card into the post box for return postage. We also recommend including a stamp on your response envelope ready to post. The second option is a Postcard-style response card which does not require an envelope for postage. The card is printed with your Return address (usually on the right of the design) so that it can be return posted to you without requiring an envelope. We offer 2 sizes of Postcard - Small and Medium - with the larger Medium size allowing more space for response areas and design elements. We recommend including a stamp on your postcard to make it easy for your guests to post. Give your guests sufficient time to respond to your wedding, leaving yourselves a week or so to get in touch with them if you haven’t received a reply by the requested date. Generally your RSVP date should be around 4-6 weeks prior to your wedding, unless if your reception / catering requires numbers earlier. If you need more inspiration and ideas for response card wording or design, we recommend browsing our Collection of letterpress invitation designs. All of our suites include a Response card (Small) with matching envelope and an example Response card is included in our free Sample Pack. Any suite can be designed with a Response card or RSVP Postcard to suit your circumstances. We appreciate the amount of work and planning that goes into a wedding, invitations and stationery being only one of these. If you have any questions regarding organising your stationery, feel free to contact us.